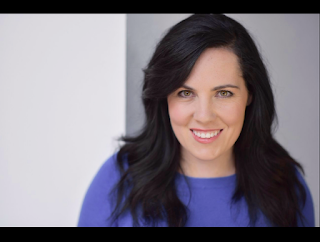 On April 1, author and editor McKenzie Johnston Winberry will lead a workshop entitled, "Step 1: Write, Step 2: ??? ?, Step 3: PROFIT," from 10 a.m. to noon at The Lodge Des Peres, 1050 Des Peres Rd, St. Louis, MO 63131. Free for St. Louis Writers Guild members; $5 for nonmembers. McKenzie will provide resources that collect publisher information, and information about conventions and other networking opportunities. 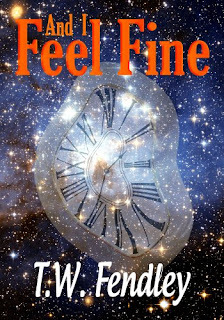 'End of World' short story, with cute boots--FREE 'til 3/24! AND I FEEL FINE: Jana’s puzzled when the traffic disappears so she makes it to work on time, and when the perfect boots and jacket appear in her cubicle just before a meeting with the big boss. She worries about her sanity until she realizes it’s Dec. 21, 2012. This is the end of the world? She pulls on her new boots and puts her theory to the test. A very engaging short story. I would like to be in Jana’s boots except for that bit about 2012. No way! I thoroughly enjoyed it. Excellent! Jennifer Stolzer: THREADCASTER launch party March 25! Welcome to JENNIFER STOLZER, an author and illustrator living and working in St. Louis, MO. 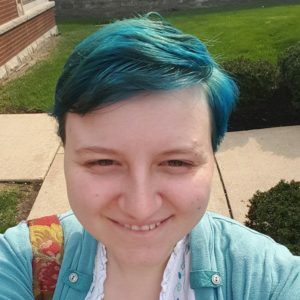 She graduated from Webster University with a degree in digital media and animation and uses this skill set to create bright and engaging characters. Her illustration company, Jennifer Stolzer Illustration, has served the St. Louis area and its authors for six years. You can see samples of her work at www.jenniferstolzer.com or on Facebook under Jennifer Stolzer Illustration. THREADCASTER launch party 2-4 p.m., Saturday, March 25, at Main Street Books, St. Charles, MO. The Writers’ Lens is about "Bringing fiction into focus." What brings your writing into focus-- the characters, the stories, the love of words? I firmly believe the focus of any story told, fiction or nonfiction, is the characters. We as humans are social creatures who learn how to react and respond to our world through social cues. Being able to communicate the human experience through the eyes of unique, authentic, living characters gives story and message a pinpoint focus. Threadcaster has had a lot of inspirations over the years, but the initial spark actually started with an image. One day back in 2005, I got the picture in my head of a girl staring at the camera with tears pouring from her eyes but no expression, as if she was filling up with water and it was pouring out of her. This image was the beginning of the Curses, a group of sick and exiled people undergoing physical disfigurement. 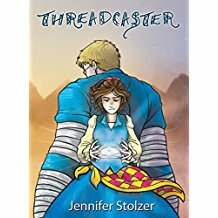 The story of Threadcaster is about a young magic user on a quest to save the Curses, including her friend Peter, who is slowly turning to earth. What do you think readers will like about your book? I hope they'll enjoy the characters. A big theme is seeing humanity in everyone no matter what, so I hope that comes through in my characters and how they relate to their unfortunate circumstances. I hope the lore is catchy, too. I worked really hard on the magic system to make the rules clear to the reader and explain how magic relates to the rest of my world. Would you share a bit about your next project? Writing-wise, I'm currently working on a ghost story set in 1900s Kentucky. It's the tale of a haunted house from the ghosts' point of view through the eyes of a six-year-old girl who died in 1906. It's more subdued than Threadcaster and set in a contemporary location, but it's all the relationship drama that love. After that, I plan to continue my sequel to Threadcaster, called Brushcaster. What are your top three reasons for writing? The joy of creation, for one. Bringing to life people and worlds that did not exist before and delivering that experience to viewers in an effective way is ceaselessly satisfying. Sharing experiences with others. I love writing characters and relationships the most, so making people laugh or cry along with my characters rewards me and fills me with glee. One of the best parts of publishing Threadcaster is hearing everyone's unique reader experience. Could they pick a favorite character? What did they think of the twist? Could they guess what was going to happen next? It's so much fun. The challenge of the thing. Writing is more than words in order, it's craft and polish and a constant quest to improve your story as a product and yourself as a writer. I've always told stories, but I've never told them as well or effectively as I do in the present, and my present work will only improve as I continue to practice. Writing is pain and reward. Writers stitch worlds and people together out of scraps of ideas and create something completely new for readers to explore. It's an amazing thing. THREADCASTER: Cat's best friend Peter is slowly turning to stone. He is an Earth Curse - an innocent suffering from one of the four elemental ailments afflicting the people of their dying world. When the pious Brushcasters drive Peter out of town, Cat embarks on a quest to discover the truth of the Curses and ransom their absent god back at last. Cat must use the Brushcasters' stolen magic against them ... armed only with the truth and a simple loop of string. Welcome to PIPER PUNCHES, the Amazon bestselling author of The Waiting Room and Missing Girl (a short novella). 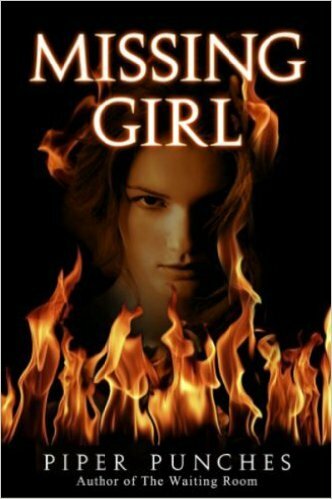 Her latest book, 60 Days (Missing Girl Series – Book 1) was published November 10, 2016. 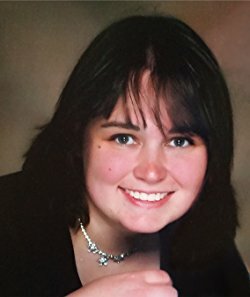 In addition to her novels, Piper’s work has also appeared in Legacy, An Anthology and featured by Indie Chicks, both print and digital platforms. She is also a writer for Thrive Global and proud to be featured alongside Katie Couric and Bill Maher for one amazing and lovely short period in time with a screenshot for proof! Piper describes her writing as purposeful fiction that is meant to entertain and inform. Check out her website for works of fiction and truth. When not writing, she can be found planning her next trip, hiking, practicing yoga, and posting Instagram photos that make her seem much more interesting than she is. Connect with Piper by email, FB, Instagram or Twitter. Check out her special offer below! The Writers’ Lens is about "Bringing fiction into focus." What brings your writing into focus-- the characters, the stories, the love of words? It’s a combination of the characters and the stories. I love to tell stories. The reason I write isn’t to tell one person’s point of view, but to explore the human experience from all angles. What brings my fiction into focus is going beyond my comfort zone to uncover the reasons for the choices people make. When I write, my goal is to make my characters as three-dimensional as possible, bypassing stereotypes and generalizations. By exploring the idiocentric ways of my characters and making them fully present and active in their situations, I hope my readers get a full-bodied reading experience. My characters are not outsiders looking in. They are not passive participants in the story. Every character, no matter how small their role, has a purpose because they are the story. My characters are truth. By exposing their flaws, exploring their fears, and picking apart their insecurities, my characters become as real as the person sitting next to you on the bus, in the coffee shop, in the school parking lot. When my fiction comes into focus – when everything falls into that magical space between imagination and realism – that is when you get a raw, authentic story that touches readers in ways they never thought possible. What inspired your latest book? My newest book is 60 Days (Missing Girl Series – Book 1). It is the full-length companion novel to my short novella, Missing Girl. Both books deal with the issue of human trafficking. It a subject that has been in the news a lot lately. Yet, when I started developing the concept of these books about three years ago, many people didn’t realize how prevalent modern-day slavery is in their own backyards. Even now, when I speak with groups of readers about my books, the majority are still shocked that this is happening in the St. Louis area. These books aren’t just about the act of human trafficking. What I really want to achieve with these books is to show the various ways people survive in situations where the line between victim and perpetrator is blurred. Where you no longer have control over your life, yet you continue to live. Missing Girl takes a first person look at what it’s like for a young girl to be in this situation. It’s very narrowly focused. With 60 Days, the storytelling is different. In this full-length novel, the reader is taken on an epic journey weaving back and forth from the past to present to develop rich characters and a layered story. Both stories deal with hard topics, but there is a softness, a gentleness in the words so that I hope the stories touch you deeply. How much fact is in your fiction? That’s a question I am asked all the time, especially with the topics that I tackle. My debut novel, The Waiting Room, is purely fictional. It is a heartwarming women’s fiction book that was solely written to entertain. Missing Girl and 60 Days are entirely different beasts. These works were written to entertain, but also to create awareness. So, how much fact is in these books? The facts are that human trafficking and modern-day slavery do exist. The fact is that women, children, and men are traded every single day. The fact is that it’s much more profitable for criminals to sell people than drugs because people can be used repeatedly without overhead. Beyond that, I encourage my readers to do their own research. I write purposeful FICTION. I take liberties to move the story along. While many of the ideas stated in Missing Girl and 60 Days are based on real situations, ultimately, the story was conceived entirely in my imagination. What are your top 3 reasons for writing? I’m always so long-winded (that’s why I’m a novelist and abhor Twitter), so let me see how short and concise I can make this. I write . . . to learn more about the human experience. I write . . . to encourage empathy and compassion for a deeper understanding of each other. I write . . . because I think everyone has a story and for as long as I can I want to bring these stories to life. What’s your favorite ways to interact with fans? I enjoy attending book signings and readings. I have also participated in several writers’ workshops presented by area high schools. Reaching out to youth and helping them find the courage and self-confidence to explore their own creative spark is so enriching. Also, I love to connect on social media. I’m not a big Tweeter, but I love engaging with fans on Facebook and Instagram. Facebook is great for conversations, whereas Instagram is the perfect platform where I can explore edges of my creativity, thinking outside of the box with my words and images. If you’re reading this, you should check out my FB and Instagram pages. The more the merrier. Special Offer! I’d love to share a FREE digital copy of Missing Girl with you. Members of my readers’ group can get exclusive access. Follow the link, sign up and confirm, to get your FREE copy. This is Sophia's story. She wants you to know who she was before that day. Before she became just another missing girl . . . Missing Girl, is a powerful, provocative story that explores the depths of familial love and the horrors of the human trafficking epidemic that plagues our global community. Sophia's story is a fictional account of what so many real- life women and children experience every single moment of their lives when they are forced into sexual slavery and human imprisonment. The bestselling author who brought you Missing Girl is back with a new novel that will pull you into the depths of darkness and make you yearn for the truth. 60 DAYS (Missing Girl Series-Book 1): Lizzie has made a lot of bad decisions throughout most of her adult life. She drinks too much. Takes too many drugs and chooses the wrong men. It is her obsession with finding her father – the man who disappeared suddenly from his family’s life 20 years ago– that eventually leads her down a dangerous path that has turned her into a person she doesn’t recognize. It’s turned her into a murderer. After all, isn’t she the reason Sophia is dead? Emily is the better sister and always making the right choices – or so it seems. These days Emily’s life is unraveling at every end. She is struggling to pay for her mother’s healthcare. Her relationship with her married boss is threatening her promotion to detective and her physical safety. To make matters worse, she and Lizzie are further apart than ever. It’s after Lizzie takes off on a whim to chase the ghost of their father that Emily’s carefully constructed life spins out of control. The authorities say that girls and women go missing every day, especially those with a history of addiction and a propensity for hanging out with the wrong crowd. Some are missed. Most are forgotten. Emily knows this is true, but she can’t accept it. She won’t accept it. Letting go of Lizzie is not an option. So when a pawnshop owner calls her with unexpected information about Lizzie’s disappearance, she heads south to the Arizona-Mexico border to bring her sister back at whatever cost. Yet, as Emily gets closer to the truth about Lizzie’s disappearance, she is forced to face her own truths about the ghost she’s running from and that she may not ever see her sister again. 60 Days is the highly-anticipated companion novel to the short novella, Missing Girl, and book one of the Missing Girl Series. Told from alternating viewpoints, 60 Days picks up after the shocking ending of Missing Girl. It takes the reader on a journey that weaves through past and present at electrifying speed. Exploring the themes of human trafficking, sisterhood, family loyalty, loss and addiction, 60 Days takes an honest look at how the choices we make can bring us to the brink of madness. 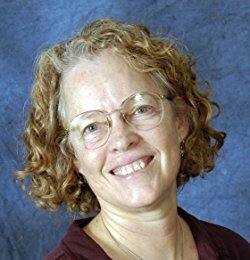 Jeanne serves on the board of Saturday Writers, a chapter of The Missouri Writer’s Guild, as Secretary and Membership Chair, liaison to MO Writer’s Guild, and manages the Information Table. What brings your writing into focus-- the characters, the stories, the love of words? Definitely the characters. They come first, arriving in the creative sphere of my brain often in ways I can’t even define. I generally start writing dialogue and then fill in the setting and narrative. However, my current work-in-progress began with the briefest flash of a scene, followed by a why/what happened question. Then the voice of a 14-year-old Somali refugee began telling me her story. So in this case, it was the story which pulled everything into focus. I don’t begin with an outline… I simply start writing. And I don’t write scenes in order; I write them as they come to me. It’s a big jumbled mess. Once I have what I think is the shell of most of the novel, I will sit down and read it, making what I call a down-and-dirty outline. I do this so I can more fully envision where the scenes go and what might be missing. I also write slowly. I would like to write at least one novel per year, but we’ll see how that pans out. I also write a lot of short stories. In 2016 my goal was to enter every single contest Saturday Writers hosted – eight contests, including the President’s Contest. I did and won seven with either a 1st, 2nd, or 3rd place. I also entered the Missouri Writers Guild Fall Fiction Contest and won 1st place for a flash fiction piece I wrote that was comically based on a true story. How much fact is in your fiction? Quite a lot. 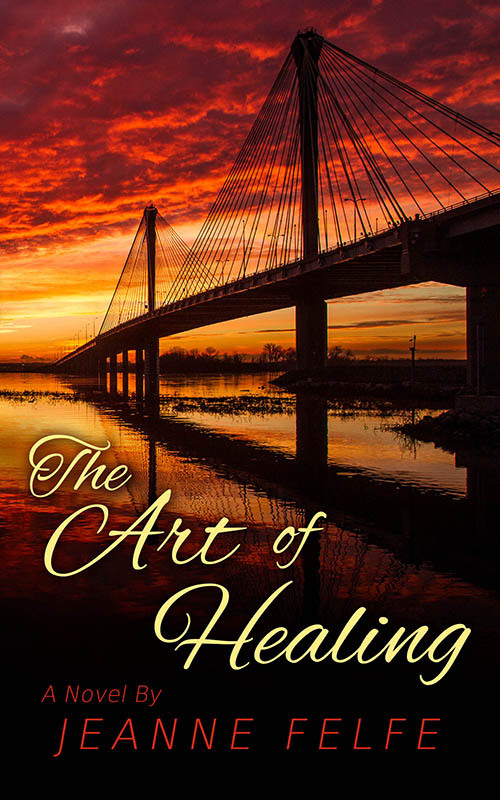 The Art of Healing visits many iconic locations around St. Louis, St. Charles, and the Great River Road, as well as Estes Park and The Rocky Mountains in Colorado. Almost all of the venues are real places I’ve either visited or researched. My current WIP utilizes a made-up, small town in South Carolina. I choose to do that, in this case, because of the subject matter and all of the “isms” raised – racism for one. Even the Urban Fantasy I wrote as a long short-story takes place in the real world. That story will eventually become a novel or perhaps even a trilogy. What inspired your latest book? The Art of Healing began as a short story several years ago from a prompt in a Writer’s Digest contest. The prompt was something along the lines of “you come home and find something not as it should be.” In 2013, I was struggling with writing. I’d retired the previous December to write full time, but I wasn’t. On June 30, a fellow writer friend, Debbie Manber Kupfer, asked if I was doing NaNoWriMo. I’d never heard of it, but she encouraged me to start the camp the following day. I did and wrote 21K words—way more than I’d ever written. Given I only had two weeks since half the month was already committed, I saw that as a success. Much of the dialogue came while tending my gardens. I’d dig while the characters chatted, then I’d go sit by the pool and write scenes, long-hand. When I came into the house later, I’d type in what I’d written. What's the highest compliment someone could make about your writing? That it made them feel. I’ve had more than one man tell me that The Art of Healing brought tears to their eyes. To me, it’s a high compliment for 1) a man to cry over something I wrote, and 2) to admit it. I strive to read deep into the emotion of a story. Knowing I’ve hit the mark is an awesome feeling. The Things We Don’t Speak Of is the story of a 14-year-old Somali Muslim refugee who finds herself living in the deep south—in a (fictional) small, mostly white, mostly Southern Baptist town. One choice, one decision, changes not only her life, but the lives of her family and everyone living in Savannah Falls, South Carolina. A cascade of events that stem from that one decision threatens to destroy the fabric of the community, and causes the townspeople to question everything they thought they believed and understood to be true. The struggle for truth, for justice, and for compassion, guide the town to a new way of being. THE ART OF HEALING: Julianne Garvoli is content with her life as a pediatric nurse. She is following her every dream, or so she believes. After her idyllic world is shattered, she must reconcile her lost past to rediscover her deepest passion. Jokob O'Callaghan, a world-renowned photographer, lives a life most could only imagine—until cancer delivers a direct and devastating slam. He walls himself off, focusing solely on his art. 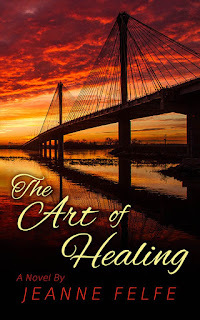 The Art of Healing is a novel about healing from lost loves, and awakening forgotten dreams. Although a love story is the central theme, it doesn’t fit neatly into the romance genre, and doesn’t follow the conventions of such. The story takes place mostly in the St. Louis and surrounding areas and includes many iconic locations. Several chapters utilize beautiful Estes Park, Colorado, as their backdrop.